Paula Moreland. Feeling liberated from epileptic seizures by deep brain stimulation, Moreland has thrown herself into writing and directing gospel plays. 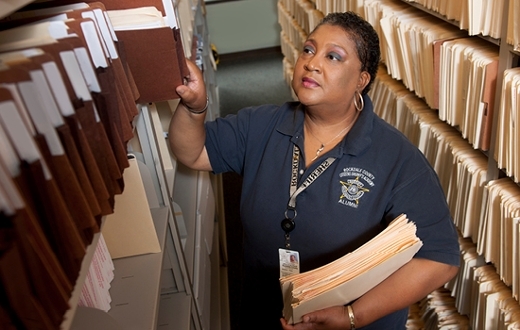 She volunteers at local schools and senior centers, as well as with the Rockland County Sheriff’s Department. As her Emory doctors told Paula Moreland how they were proposing to treat her seizures, her eyes grew wide. Moreland's mother, who was with her at the appointment, said, "Just listen to them, babe." A surgeon would implant an electrical stimulation device deep within her brain. The device would deliver current to calm the storms of signals that would sometimes erupt and cause her to lose consciousness. Moreland had already seen several neurologists and tried a variety of anti-seizure drugs. At one point, she was taking seven different medications. "They didn't seem to work, and they made me sick," she says. "I went to talk with one doctor, and he threw up his hands. It was like he was saying, 'I give up.' "
Epilepsy seemed to have come into her life out of nowhere, Moreland recalls. A divorced mom, she was traveling often for her job at a telecommunications company. Her doctors hypothesized that a car accident in Florida may have stirred up the seizures, but a precise cause was never pinned down. Twice, seizures occurred while she was driving. She doesn't remember the accidents that followed, but she does remember the odd feeling (sometimes called an "aura") that preceded them. She once lost consciousness after a seizure at a bible study meeting. Her family suggested that she see doctors at Emory, where she underwent diagnostic procedures, including surgery, that kept her in the hospital for a month and led to painful swelling. Her daughter started crying when she saw her with a shaved head. "I laugh about it now, but it was hurtful then," Moreland says. Thomas Henry, the former head of Emory's epilepsy program, described deep brain stimulation to her. It may have seemed risky to try an experimental procedure, but Moreland was willing to take the risk. "If I had to choose between the epilepsy and having only one leg or one arm," she says, "I would not choose epilepsy, because of the loss of control." At that point, the only tested-and-proven measure against drug-resistant epilepsy was surgery to remove the part of the brain where seizures originated. In Moreland's case, that region was the hippocampus: the same region she depended on for remembering words and forming memories. 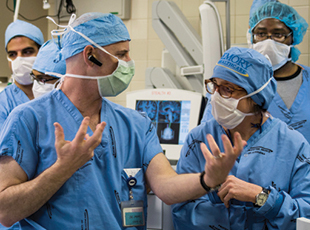 Neurosurgeon Robert Gross (above, talking with neurologist Helen Mayberg) conducts a majority of the deep brain stimulation surgeries performed at Emory. "That's the reason why we thought she was a good candidate [for deep brain stimulation] and why she was enrolled," says Emory neurosurgeon Robert Gross. "The only other option at that time was to resect the temporal lobe on her language-dominant side. If she experienced negative effects, we could simply shut the current off or even take the device out if it was completely ineffective." Two wires were inserted under the skin of her head and carefully positioned through two small drill holes that lead to the region of the brain called the thalamus. The wires run down her neck and are connected to an electrical stimulator with a battery implanted under her collarbone. Now, several years after surgery, Moreland is nearly seizure-free. She continues to take the anti-seizure drug carbamazepine. She says there are some effects of the stimulation on her short-term memory. "I need to write things down," she says. "I can remember things from 20 years ago, but sometimes my family needs to remind me about something I did just a little while ago." Moreland is an active community volunteer and writes, directs, and produces gospel plays. Still, it took seven years before she had the confidence to drive again, and she does not go long distances. She says she is blessed to have a large group of supportive friends and relatives. Her plays have been performed at community venues such as Big Miller Grove Baptist Church, where she is a member, and at her alma mater, Liberty University. She also appears as an extra in the film Selma. "I feel like a walking miracle," she says.